The Old Barn in Winksley Banks, near Harrogate sleeps 6 people. 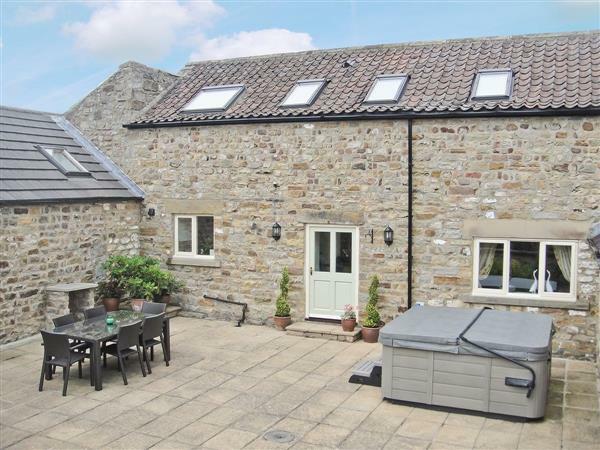 This holiday barn conversion is set in a pretty courtyard on the outskirts of the picturesque village of Galphay which is just a 10-minute drive from Ripon. An ideal location from which to tour the Yorkshire Dales with both Harrogate and York easily accessible. Carefully converted, it blends traditional features such as exposed stonework, flagged floors and beams together with carefully co-ordinated furnishings and fabrics to create a wonderful ambient atmosphere. Just a 5-minute drive from the historic Fountain’s Abbey. Shop 1½ miles. Pub and restaurant 1 mile. Ground floor: Living room. Dining room. Kitchen. First floor: 3 bedrooms: 2 double, one (5ft) with en-suite shower room and toilet, 1 twin. Bathroom with shower over bath and toilet. Woodburner in living room included. Oil central heating, electric, bed linen and towels included. Two Freeview TVs. DVD. Electric cooker. Washer/dryer. Dish washer. Fridge/Freezer. Enclosed courtyard with furniture. Barbeque. Parking (3 cars). Hot tub. No smoking. Holidays run from Friday to Friday. The Old Barn is in North Yorkshire; should you be on the lookout for a special offer, you can find all the special offers in North Yorkshire. It's always worth checking to see what is on offer at the moment. Do you want to holiday near The Old Barn (26170), you can see other cottages within 25 miles of The Old Barn; have a look to find your perfect holiday location.